Israeli premier to meet with US Secretary of State during visit to Brussels. Two leaders to discuss fighting along Israel's northern border. Israeli Prime Minister Binyamin Netanyahu is scheduled to meet with US Secretary of State Mike Pompeo Monday evening, during the premier’s visit to Brussels. Netanyahu planned to leave for Brussels Monday morning, where he will meet with Pompeo for talks originally slated for Wednesday. The meeting was rescheduled for Monday, however, after the funeral for former President George H.W. Bush was set for Wednesday. The Prime Minister will be accompanied by Mossad chief Yossi Cohen, National Security Council chief Meir Ben Shabbat, and the Military Secretary to the Prime Minister, Avi Blut. 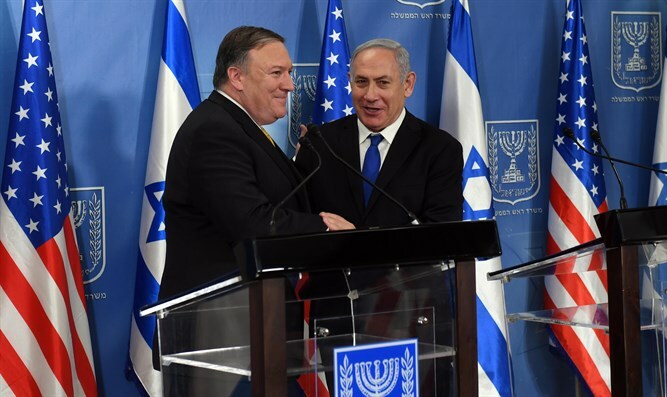 According to the Prime Minister’s Office, Netanyahu and Pompeo will focus on recent regional developments, particularly in Syria, and clashes between Israel and its war-torn neighbor to the north. Netanyahu has hoped for greater US involvement in Israel’s bid to force Iranian units stationed in Syria away from the Israeli border with Syria. While the US has vowed to support Israeli efforts to protect its borders, no clear steps regarding Iran’s presence in Syria near the Israeli frontier have been taken, in part due to the complicated relationship between the US and Russia, Syria’s largest patron.